I’m usually not a fan of photographic covers, but I do like the composition of it – I love how her hair swirls out from the city. I really enjoyed The Hundred Thousand Kingdoms. It was a quick read, especially compared to most other epic fantasy out there. The narrator has a very compelling voice, and the book played with time and storytelling in some interesting ways. I got sucked in almost immediately. 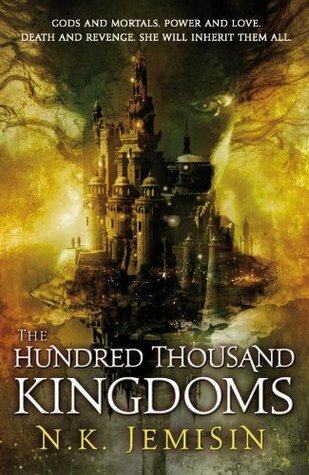 The Hundred Thousand Kingdoms is about a young woman named Yeine Darr, who’s the granddaughter of the man who rules. When her mother dies, Yeine is unexpectedly brought into the fold of the world’s most powerful family and named one of three heirs. While Yeine may not care for the throne, she’s now at risk in the deadly power struggle. Also, it wins points for diversity – the characters are all different skin tones and body types, with Yeine herself being “short and flat and brown as forestwood.” Race is one of the themes dealt with in the book, along with slavery and class. However, The Hundred Thousand Kingdoms is not without it’s flaws. While it is mostly well written, whenever it got into a romance scene it had a tendency to head for purple prose. After a while I started skimming those sections or skipping them outright. I don’t think I missed much – if the other reviews are anything to go by, skipping these sections probably improved my overall impression of the book. The entire romance plot set up was very cliched in the first place. The “misunderstood, totally powerful, bad-boy love interest” has been done so many times before. Anyway, I overall liked The Hundred Thousand Kingdoms and would certainly recommend it to any fantasy fans, particularly those looking for something a bit different than the usual run. I haven’t gotten a hold of the next one yet, but it’s definitely on the horizon. I really liked the trilogy. Some of it is a little cliché but Jemisin brings so many different things to the series it’s well worth reading. I have two of her Dreamblood books sitting on my “to read” shelf. I read this book some time ago and wasn’t a huge fan. I agree with you on the romantic scenes. The ending also really annoyed me. But people LOVE this series, so maybe I should just continue with it. If you personally didn’t like it, I don’t see any reason for you to continue with it. Why base your decisions off of how other people feel instead of how you feel? I guess it depends on how important the romance aspect is to you and if you’re okay skipping sections. It didn’t effect the whole book, only certain scenes. I’ve had the first book of both of her trilogies for awhile, but the negative aspects of reviews have been driving me off. The negative aspects were why this one sat in TBR for as long as it did. But when I finally read it, I really enjoyed it. Yes, there’s conspicuous flaws – i.e. the romance, but I found it pretty easy to skip those sections and enjoy the rest of it. There were definitely aspects of this book I didn’t love — and yeah, the prose can get verrrrry purple at times. I did like you and skipped past the bits that bored me. In the end, I felt generally positive about Jemisin, and I want to go back and read some of her most recent stuff. Doesn’t sound like the type of book I’d usually read so I appreciated your review. N.K. Jemison is on my list of authors to read. I’m still curious, and will be adding at least one of her books to my collection. Thanks for your review! She’s one of those authors who’s books I’m keeping an eye out. In addition to The Hundred Thousand Kingdoms series, I’ve also heard a lot about her book The Killing Moon. I read The Killing Moon first about a year ago, and was a big fan, but the novels are VERY different. I, too, skimmed through MOST of the romance-y parts. I actually thought Nahadoth was an interesting character apart from the weird love stuff, but I tend to be a sucker for the antihero. I think Nahadoth had the potential to be very interesting, but whenever he showed up, the scene tended to devolve.